I'm pretty close to the first engine start but I'm in a dead end with the trigger offcet settings. My be I'm blind but I just don't find where to enter my offcet number because the PC Link trigger calibrarion menu is locked for the offcet degree number. My VW VR6 12V engine has 60-2 target wheel on the crank and the TDC 1st cyl is 84 deg (on 14-th tooth) after the gap has passed the CAS in the direction of rotation. My understanding is that I have to enter first the offcet number then the Ref timing number and at the end using a timing light via the "Set Base Timing" sub menue to fine tune the Trigger Offcet degrees. I guess I miss something though. Your advice is highly needed. Open the "set base timing" screen, that is where you enter the offset. Remember to hit the enter key after changing the offset. So.. in the "Set Base Timing" screen I have to enter the -84 (or 276),. hit the Enter button and then to... attempt to crank/start the engine? Also my synch trigger is a "Half moon" type with the window centered exactly "over" the gap on the 60-2 trigger wheel according to the scope. Hall sensor. 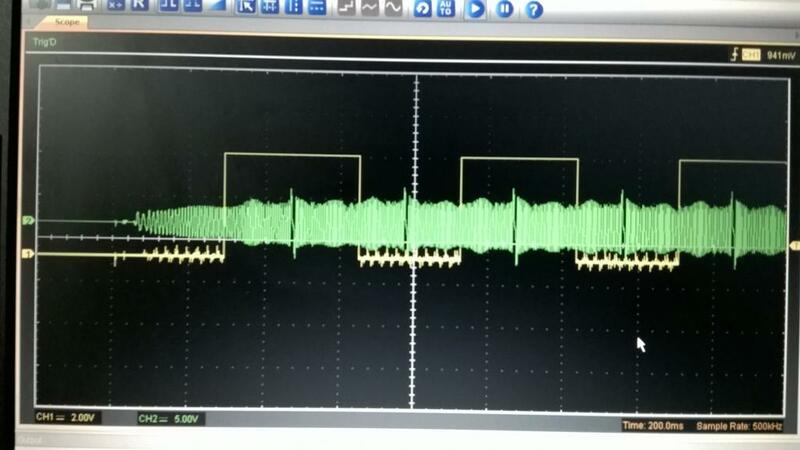 The synch mode is set to "Cam Level" Are these signal alignment and synch setting correct? Endless thanks again for your support! yes one of those will be close to correct (-84 or 276). I cant tell you which one though, it is just normally easiest just to try one, if it doesnt start or backfires, use the other one. All of your other settings sound ok.
Now, the Offcet number is already on its place. What confused me so far was that I always tried with the "Done" button in the "Set Base Timing" screen instead to hit the "Enter" one. Just a little feedback. The engine is running on the factory settings. It is pig rich but running. First I tried with -84 deg offcet but received a pop inside the manifold. Then changed to 276 deg and it started like an OEM :-). The timing light showed 277 deg offcet is the perfect match. I checked the settings. The master was 15ms which appears to be too high for my 60lb Siemens Deka injectors at 45psi base pressure. I'm very happy with my Link ECU so far. Especially with the "Differential pressure" channel. A very, very useful thing. Here is a short video with the factory settings "in charge" engine start. Only 3"diameter short down pipe from the turbo. The idle is on two wire Bosch solenoid valve. Some problems with the alternator charging because I switched to a LED lamp. Fixed now. Just want to ask if you see something unusual on the next picture. The setings are described earlier in this thread. What bothers me is the 0.5V noise on the low level of the synch Hall signal. The Hall sensor is 12V powered but the output trace has 5V amplitude. Is that normal? When using a hall sensor the switching threshold is about 1.2V, so provided the noise on trigger 2 is less than 1.2V you should be ok. Note the scope capture above shows your crank sensor is connected wrong polarity, you need to swap the wires. I'm confused a bit because I've already swapped the trig 1 wires according the manual. Please, would you check that again? 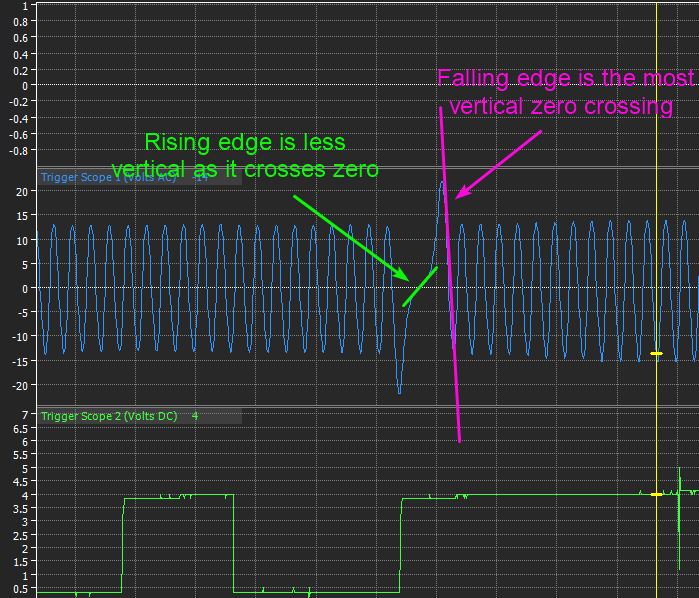 Now, I have falling signal line at the missing tooth zero-crossing, i.e. from high to low. That waveform above is correct for a tooth. However the area that you are getting confused with on the crank waveform is actually a "missing tooth". Missing tooth wheels are a little more difficult to see or visualise the correct polarity, you need to look at the gap area and you want the falling edge to be the most vertical zero crossing. Hopefully my picture below will help explain it, this picture shows the correct polarity.